SpaceX to fly two space tourists on a week-long trip around the moon NEXT YEAR. I presume one of them is TI? SoaceX to fly two space tourists on a week-long trip around the moon NEXT YEAR. Was this always part of the plan? Sudden jump into space tourism seems a bit frivolous for SpaceX, although its probably good for cashflow? Only if I can get some sort of tax break to cover the cost! @NorvilleBarnes was it always part of the plan? Yes and No. Everything SpaceX does is about getting to Mars. 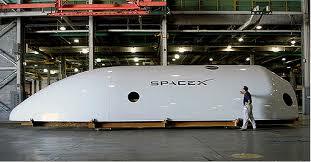 Crew dragon the human-rated version of their capsule is designed to deliver astronauts to the ISS and the development cost were covered by NASA. It has propulsive landing capability and so can land like the SpaceX rockets. So they plan a Red Dragon mission in 2020 to land a dragon capsule (without humans) on Mars, but they need more deep space experience. Many had speculated that they would send an empty capsule around the Moon but others said they wouldn’t to save on costs. What Musk announced was classic SpaceX. Now they get the deep space mission experience and someone else covers the costs. I’ll say it again, what Musk has done (and to a lesser extent Besos) is to make space exciting again. It’s been 45 years since Appollo 8 orbited the moon. In my entire life, no men or women have been further away than low earth orbit. I can’t wait to see two non-professional astronauts do what the professional ones and their respective agencies failed to do for the last >40 yrs. If the rocket Elon Musk’s SpaceX expects to launch next week looks familiar, that’s because it is. **The Falcon 9 rocket slated to take off from Kennedy Space Center in Cape Canaveral, Florida, has flown before, marking the first time Space Exploration Technologies Corp. will refly one of the 14-story-tall boosters it recovered from past missions. **The reused rocket will ferry a communications satellite into orbit for Luxembourg-based SES SA, SpaceX’s first commercial customer, and signals a leap forward in Musk’s 15-year-quest to drive down launch costs and eventually create a human colony on Mars. The reused rocket will ferry a communications satellite into orbit for Luxembourg-based SES SA, SpaceX’s first commercial customer, and signals a leap forward in Musk’s 15-year-quest to drive down launch costs and eventually create a human colony on Mars. It’s very exciting, this will be the first time an orbital rocket that has been to space will be reflown. I’ve already got my popcorn. Well the shuttle was an orbital rocket that was regularly reflown, but its operation and refurbishment costs were so high that expendable rockets were cheaper. For spacex to succeed in its reusability goals, it has to ensure that these costs are kept low without affecting reliablity. They’re government funded. They’ll receive endless amounts of funds till they get it right. The first launch then landing then relaunch and relanding of an orbital class booster rocket. This dramatically reduces the cost of access to space. I look forward to the day within my lifetime of the Ryanair turnaround model for rockets. Not looking forward to them hawking lottery tickets and Hertz on the flight though. Cannot stop watching the landing vid … struts pop out five seconds before a flawless touchdown on a heaving barge. It’s mad! I know nothing about Rocketry but that landing is impressive. It looks like a scene from a Sci-fi film. One of the less reported but very cool thigs in this last mission was that also for the first time ever SpaceX recovered the fairing intact. The fairing is the clamshell thing at the top of the rocket that encapsulates and protects the payload (satellite) on its way up. The Fairings until now have simply burnt up or smashed into the ocean. They are not cheap at about $6 million dollars a go. That’s not so much if like ULA you charge circa $250 million per launch but SpaceX charged $62 million for that last launch so at $6m a pop it now becomes an appreciable % of the launch costs. 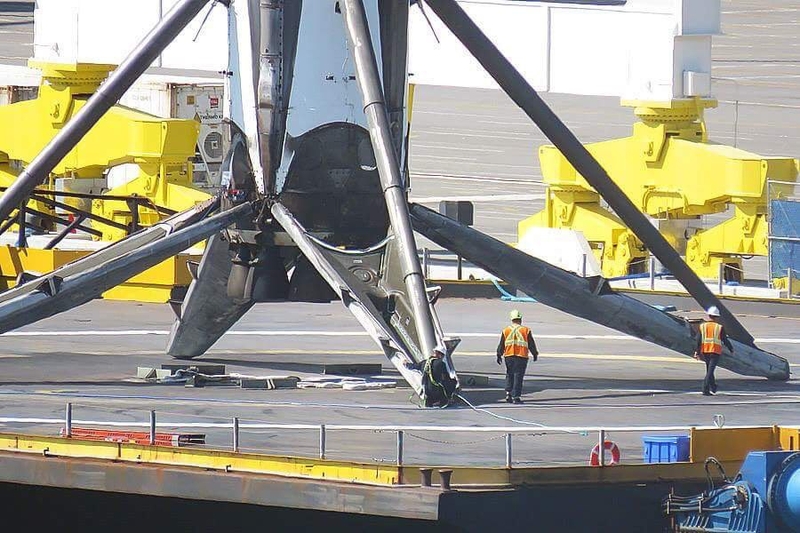 SpaceX has been experimenting with fairing recovery but this was the first successful recovery. Basically the fairings now also have thrusters and an attitude control system. So after they are jettisoned, they steer themselves into an orientation for re-entry. As they are so light and have a large surface area they are already a good shape for reentry and for flying through the air. 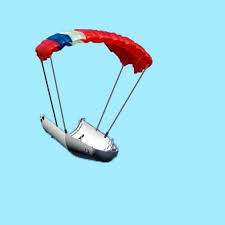 They are basically glided down and when slow enough a steerable parachute is deployed to gently land it in the ocean. Recovery of the single engine 2nd stage is the only part of the rocket remaining to be recovered. That and a 24-hour turnaround are the next goals. It feels very sci fi because that’s how all the very old sci fi rockets landed. I love this pic, just look at the size of those legs! just goes to show how impressive it is to actually land this thing. I love this pic, just look at the size of those legs! just goes to show how impressive it is to actually land this thing. Why not use 3 legs ? I imagine it’s all about centre-of-gravity. The CoG must stay inside the base or the booster falls over. The tipping distance is nearly 50% greater for four legs. 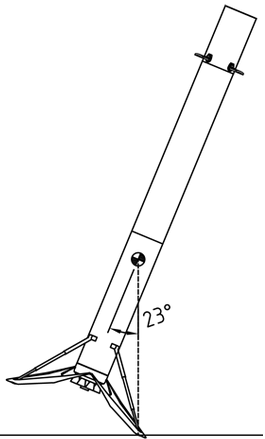 The angle that the booster would have to lean to make this happen depends on where the CoG is vertically. A poster here estimates that the engines are pretty heavy compared to the empty booster tanks, and puts the CoG at 14.9 m vertically. 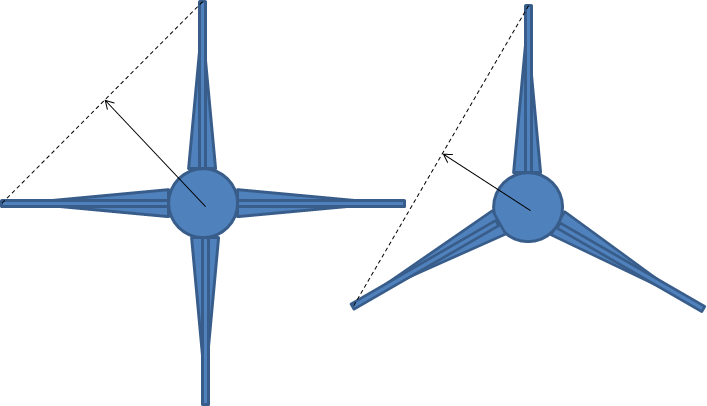 Note, he uses a smaller value for the leg span than SpaceX provided, and so gets a smaller angle of inclination. Definitely a case of “four legs good, three legs bad”.